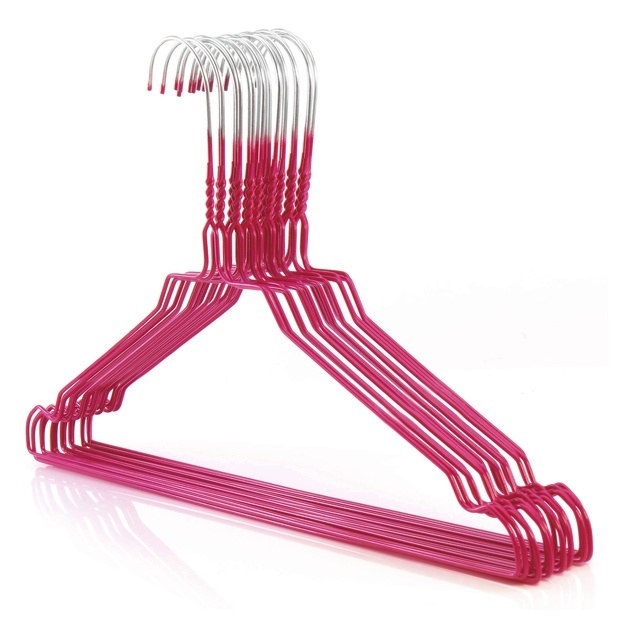 Galvanised steel metal wire hangers with a tough, polyurethane powder coated finish in pink. Squared neck shape for better presentation of shirts etc. Ideal general use hanger for tops, shirts, blouses, woolens, jackets, coats, trousers, dresses etc. Suitable for use with trouser and shoulder guards. Made from 13 gauge steel. Please note that 13 gauge (British Standard Wire Gauge) is 2.337mm but standard manufacturing tolerances mean that the wire may +/- 10% of this measurement. Size: Width 40cm (16") approx. Love the colour; well made. Takes up little space so great if you have a lot of clothes to hang up in your wardrobe/cupboard.